A group of embedded developers from Sioux Embedded Systems in Eindhoven, the Netherlands, wanted to get experience working on Microsoft .Net. 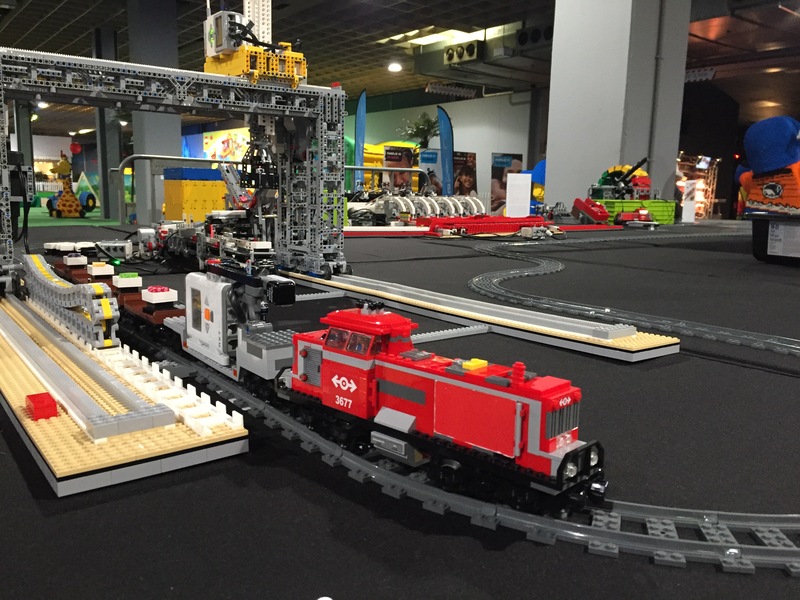 To make it fun they made it their project to produce a LEGO train with visitors at LEGO World, the official LEGO convention in the Netherlands. The team developed an application in C# to fully automate the train, with Mindstorms NXT and EV3 bricks as well as LEGO Power Functions motors controlling everything. The train project carries a simple premise: the visitor chooses one of four colors, and the train goes and picks up a piece of simulated candy with the matching color. Called Sioux.net on Track, the project has produced a new train every year since 2012 with improvement goals in place to add features with every version. Ironically, the least interesting part of the setup is the actual train and track. The team’s creativity comes to the fore in two areas of the project: the method by which the candy color is selected, and the assembly that dispenses the correct color into the train car. Team member [Hans Odenthal] has built candy-grabbers for various years’ trains. He learned about the ABB FlexPicker and this year decided to build a delta robot for the layout. 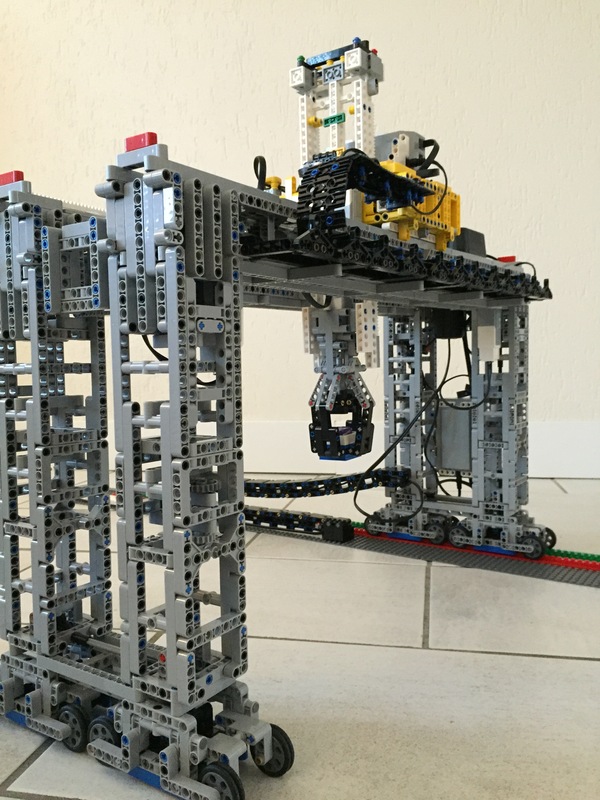 It consists of huge girders constructed from 5×9 and 5×11 Technic beam frames held together with more Technic beams and hundreds of connector pegs. The three arms each move on a pair of turntables which are geared down to provide as much torque as possible — the fake candy pieces are light, but the arms themselves weigh a lot. [Hans] ended up revamping the gearboxes to up the ratio from 1:5 to 1:25. The “business end” of the gripper is a triangular series of beams that gets placed around the piece of candy to be grabbed, after which the trio of pneumatic actuators close the gripper’s three fingers. [Hans] created a sub-assembly to run the pneumatics — in essence, an air compressor. 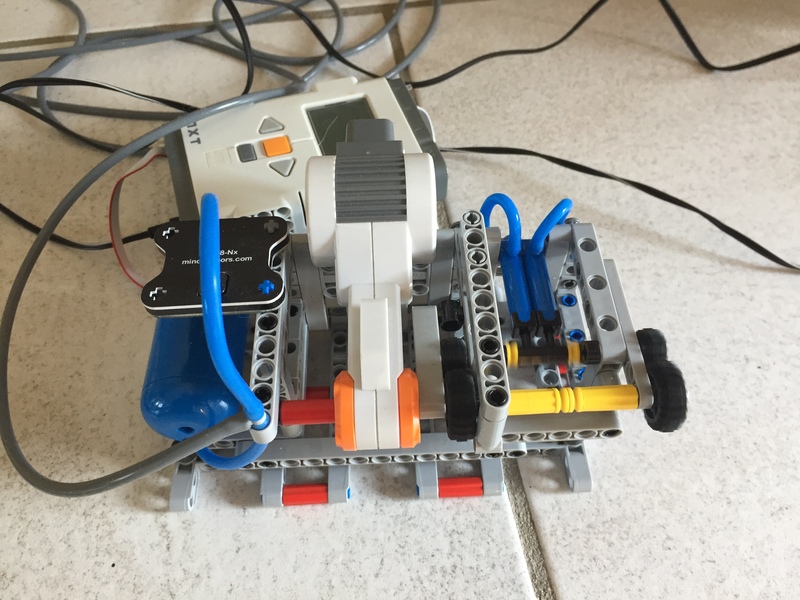 It consists of a Mindstorms NXT brick monitoring a Mindsensors Pneumatic pressure sensor. Meanwhile, a pair of pumps keep the tank topped off. Creating such a large pneumatic assembly proved challenging, and [Hans] was forced to upgrade his pneumatic tank and tubing along the way. I particularly appreciated the fact that [Hans] also built the delta bot in LEGO Digital Designer, a virtual building tool the LEGO distributes for free. In addition to being able to prototype a creation when one doesn’t have the parts, LDD is great for saving LEGO creations for future rebuilding. Have you Made something cool but need the parts for another project? Just build it virtually and you can re-create it whenever you want. This arm isn’t the only over-the-top candy grabber [Hans] has produced. 2016’s version was a monster gantry that could fit over a number of train tracks. The gantry features a claw-style gripper and also includes very cool cable carriers made out of LEGO parts. Visitors turned a colored wheel to select the color of candy, and the a card decorated with color swatches rolled through a scanner that sent the train to fetch the right kind of candy. [Hans] also worked on an impressive Mindstorms arm. Originally it was to be the candy-grabber for the 2017 show, but when [Hans] was inspired to create a delta bot, it was set aside. However, there’s a lot to like about this attempt, with 6 DOF and a pneumatic gripper, and I can see the improvements from this version to the delta bot. To follow along with the team and their builds, check out their blog, watch their YouTube videos, or check out their photos on Flickr. It is amazing what things can be built of the Lego+technics stuff, for what seems to have some limitations the ideas are limitless. Still, what is also amazing is the people (not shown here) who have made pneumatic engines that work and run off compressed air. I’m close to retirement, but I think i’d drop everything and apply to a job that lets me build stuff like that all day long. After you retire, you could volunteer at a middle school or something, but why wait? Indeed, why wait. I found an employer that gives me the opportunity to combine learning new technologies with fun. And even better: the result will be shown to kids to stimulate technology in the Netherlands (unfortunately, still hard needed in our country). FWIW robots, and lately delta robots are used extensively in the food industry for “pick and place” – putting consumer SKUs together. You know all those assorted chocolates in one box? Yeah, that, and a zillion other applications.